I always thought there was no end to cookbooks. It seems this is true about diet books too. While we know it's what we eat that determines whether or not we put on weight, and that a healthy diet and exercise are key to losing and maintaining your goal weight, none of this is easy to implement. So? We turn to diets. Lose a little but gain more. Ever met anyone who is dieting and in a good mood? Not often. Author and nutritionist Susan Kleiner has put together ways for us to not only lose weight, but to feel food at the same time. "Most diets, unfortunately, cause chemical changes in the brain that make the dieter feel depressed," says Kleiner. 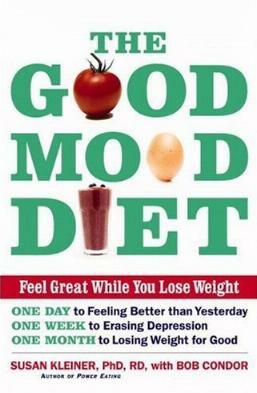 And, "The Good Mood plan encourages you never to feel hungry - and that keeps your emotions positively fuelled all day". Of course it's also about eating the right combination of foods. We're given a list of "Feel-Great Foods" which should become part of one's daily diet as per Chapter 3. They include Bananas, Egg Yolks, Nuts, Olive Oil, Pork, Turkey, and whole grains among others. By all accounts, you won't starve. You'll learn about which foods benefit what part of your body. Which foods will help with bad moods and calm you down. When to snack and on what to snack. We're also given menus to help plan ahead, recipes, and food groups (and portions). It seems fish (omega-3 fats) is essential to a healthy brain. We've got to eat more fish. Kleiner's customers' testimonials are also included. However, I draw the line at canned salmon. It reeks like cat food, and tastes like it too. It's surprising just how much you have to eat. Visit Ms. Kleiner's website at: www.goodmooddiet.com for more information. Conclusion - Very interesting and convincing. Always helpful to know what you're eating and how it affects your body.